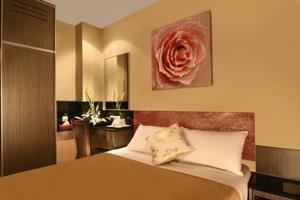 Fragrance Hotel-Sapphire offers value-for-money accommodation in the lively and vibrant Geylang. The hotel offers free parking and is a 10-minute drive from the Central Business District and Orchard Road. The cosy rooms at Hotel Fragrance-Sapphire come with modern décor and warm lighting. Each room has amenities that include a cable TV and tea/coffee maker. Hot shower facilities and toiletries are available in the en suite bathroom. The hotel has a 24-hour front desk that can assist with guest requests. For convenience, laundry services are also provided. Hotel Sapphire-Fragrance is a stroll from a variety of local eateries and Aljunied MRT Station. Changi International Airport is a 20-minute drive from the hotel. Rooms: Hotel Rooms: 50, Hotel Chain: Fragrance Hotel.